Welcome back to the Vegas recap! I woke up at 8ish feeling super nervous. My stomach didn’t feel right and I felt anxious for the race. The girls eventually woke up and we went on a trek to find breakfast. We totally should be planned ahead because it took over an hour and a half (!) to get breakfast!!! All I wanted was a bagel with peanut butter. Should be simple. Not so much. While I waited, the girls decided to check Red, White, and Blue where we ate the night before. And guess what? Success!!! They had exactly 3 plain bagels left and plenty of PB. Phew! After eating, we kind of just hung around the room and watched tv until it was time to get ready. Afterall, can’t use up whatever energy we had, right?? I agree, we were lame. 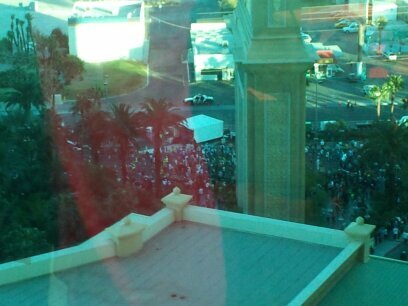 Anyways, I loved our hotel room because we were able to see the full marathoners start at 4! It got me SO excited and pumped!! 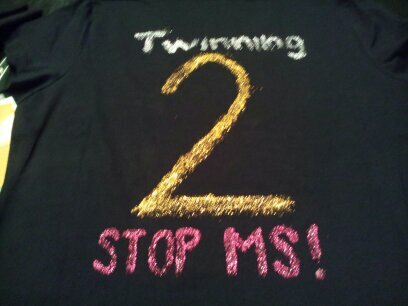 I knew it was cold outside, so I suited up with capris, a cold wear long sleeve pink shirt, and my “Twinning 2 Stop MS” t-shirt over. Completed with my Run to Stop MS headband to cover my ears. 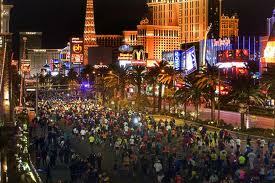 I couldn’t stop jumping up and down — we were finally running the strip!!!! 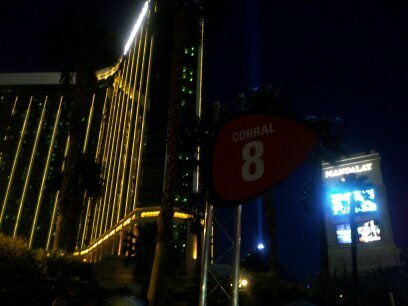 We headed downstairs around 5:15 (the race started at 5:30), jogged a little to warm up, and then found corral 8. 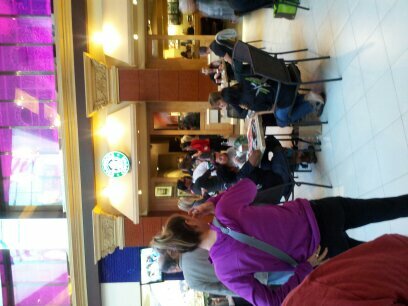 It was PACKED with people. I felt really claustrophobic and couldn’t wait for things to get going. Em and I planned to try to run together as long as possible so we linked arms as we started moving towards the start. And before we knew it, we crossed the start line! I ran the entire thing with my phone plugged into Cardio Trainer. (It’s about time I get a Garmin, don’t you think?). The race was extremely crowded so Em and I tried to weave together as much as possible. It worked pretty well and we were going pretty fast in the beginning. The cold was getting to Em.. she’s from Florida and isn’t used to running in cold weather so it was bothering her lungs and eventually, she also got side cramps, probably from breathing differently. She was a trooper though and stayed with my for the entire first half of the race! But it got to be too much for her and she ended up hanging back more. I took a Clif shot blok at 6.5, but it didn’t settle well with my stomach. 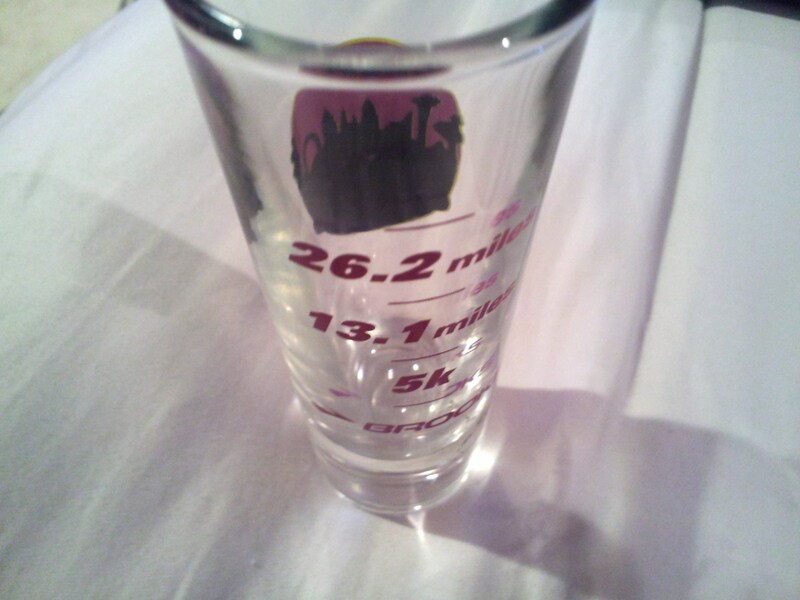 So I ditched the 2nd one that I had brought with me and decided to stick with water for the rest of the run. I felt really strong through the whole race until the end. I’m not sure if my phone was off or if the course was longer than 13.1, but I started getting frustrated when I saw 13.2, 13.3, 13.4 tick by with no finish line in sight! Finally, I crossed at 13.6 and the phone said 1:57:36! YES!!! I felt so happy and relieved and ECSTATIC!! I finally beat 2 hours and it didn’t even feel that bad. I wasn’t dying. I finished strong and felt so alive! But it was a little depressing having no one to celebrate with at the finish line. 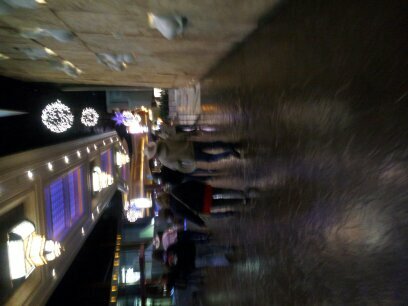 I made my way back into Mandalay Bay and waited for Michelle and Em to finish. Em crossed the line at 2:01:29 (awesome, since she didn’t really train AND she ran a half marathon 2 weeks earlier!). And Shelly crossed at 3:01:35 — a PR for her! After tracking down the girls, we went upstairs to shower (ice baths for Em and Michelle.. I tried but couldn’t handle it) and get ready. I kind of wanted to go out, but Mich wasn’t feeling great so we stayed in Mandalay. They had a little bar with only frozen drinks so we went there. I got a huuuge pink drink to share with the girls and we actually had a good time — the bartender put on a crazy show to music and it was awesome. Flipping cups and bottles all over the place. Plus, free shots! Can’t complain. The night was a fun laid back time, but I was sad that the trip was ending :(. The day I dreaded. Time to leave. We got up early, packed up the room, and headed to the airport. In the cab, I realized that I didn’t have my phone! I called Mandalay on Shelly’s phone, but they said they had to send house keeping up to my room to check for it. Bummer. I had plenty of time to go back if they told me it was there right away. Instead, it took them an HOUR to call me back and then another 30 minutes to transfer from the main desk to fedex to the front desk again to lost & found to the front desk AGAIN. Then, I got hung up on and it took another 10 minutes to finally get confirmation that my phone was being shipped home. Ridiculous. I loved Mandalay Bay until I had to coordinate my phone haha. At the airport, we grabbed a quick breakfast with Emily before she had to go to a different part of the airport. It was sad to say goodbye to her :(. The flight home was a tad bumpy again and our landing was super foggy, but we got home quickly. GREAT race. And I cannot wait for another Vegas trip when I can actually go out and enjoy TYPICAL Vegas haha. With an official time of 1:57:22! Can’t believe I had a 7:42 mile! Hola!! D here.. hope you guys are having a great weekend so far. Time for a Vegas recap! 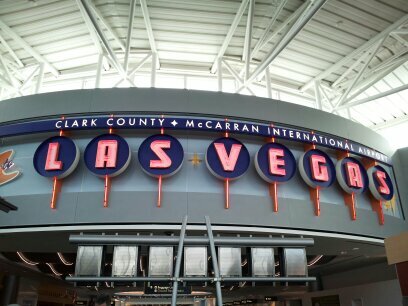 This was my first time in Vegas and it was a TAME trip. Can’t wait to go back for a true Vegas experience! The weekend all started on Friday morning. 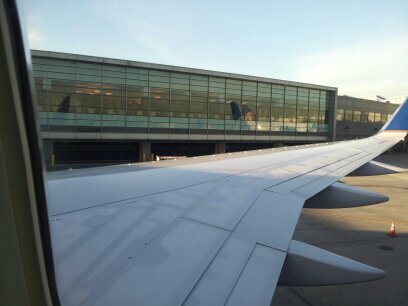 Michelle and I stayed at my fiance’s house on Thursday night and he drove us to the airport bright and early! 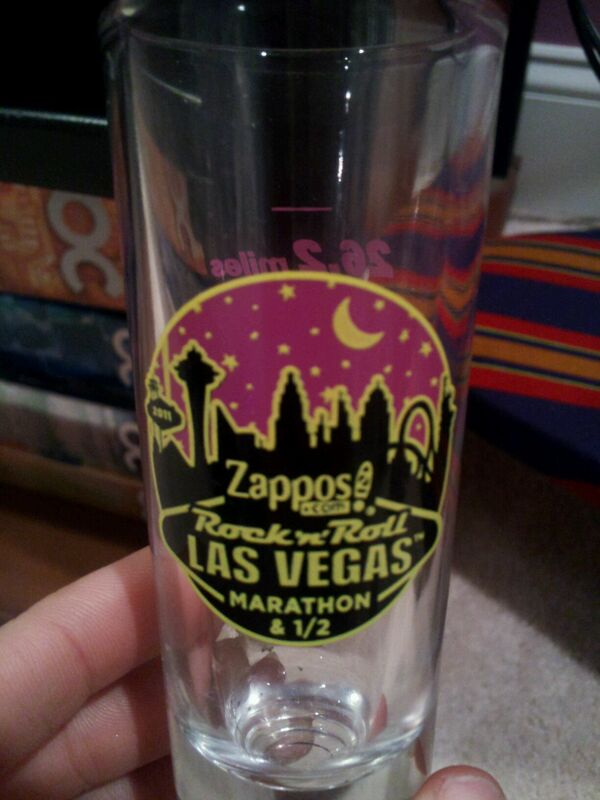 Check in was a breeze and we were so pumped for Vegas to finally be here — we signed up for this race MANY months ago! 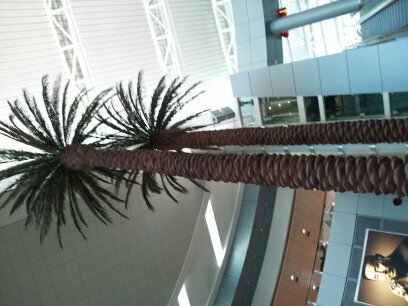 Safely at the gate :). Landing in Vegas was amazing because you could see all of the gorgeous red mountains and I loved that we could see our hotel (Mandalay Bay) from the runway! 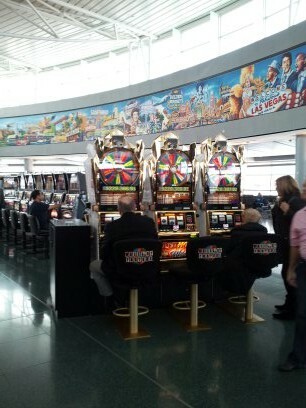 Also loved that slot machines greeted us the second we got off the plane. Michelle convinced me not to lose all of my money.. yet. We quickly got into a cab and headed for our hotel. We had a great room on the 14th floor.. my lucky number! Shelly and I were waiting for my friend Emily to get to Vegas from Tampa so we unpacked and grabbed some lunch at a Mexican place. No bueno. The chips were awesome but the veggie burrito gave me the worst stomach ache. Not good on 1/2 marathon weekend! We headed to the strip after that. Vegas is great for people watching — so many interesting characters! But one of the cool things about our weekend was that pretty much everyone was either a runner or a cowboy!! There was a rodeo event the same weekend. I had never seen a cowboy in person before so I loved it. Kinda blurry but that was a cowboy carrying a lasso!! We walked from Mandalay to the Venetian to check out a little bit of the expo before it closed. It was pretty dead when we got there around 7:15 so we got our bibs (couldn’t get Emily’s though 😦 ) and checked out some merch. Finally, Em landed!! The plan was to grab dinner with her and her dad who was there on business and then see the Cirque du Soleil show “O” in the Bellagio. We had a little miscommunication with the scheduling of the show so we had a HUGE time crunch. Luckily, Bellagio had a pretty good buffet so we got some eats there before seeing the amazing show! 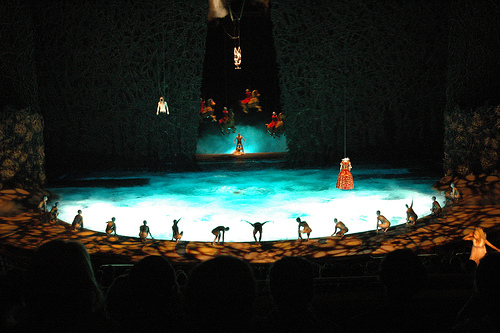 I’ve always wanted to see a Cirque show and “O” was the perfect one for my first! The stage was a big pool and there were tons of cool effects with the water. I loved it! By the end of the show, we were all exhausted so we took a cab back and passed out! Although I would’ve LOVED to sleep in on Saturday, my body naturally woke me up around 8 so I decided to do a shake out run in the hotel’s gym. I guess I’m not that stealthy and I ended up waking the other girls up! So they joined me. The gym was PACKED! All 8 treadmills were taken — I guess that’s what happens when a running event is scheduled for the next day! Luckily, we didn’t have to wait long and I was able to get in a slow 2.5 mile run in. It felt awesome to run! This was the point where I really started thinking about my time goal (sub 2) and freaking out!!! Ugh. The run left us all .. starving! So we headed to Denny’s (there are a million of them on the strip!). I had never been there before and it was not a good first experience. When we sat down, I noticed that the water glasses were teeny tiny so I asked the waitress for a big glass. Nope. Can’t do that. What about a pitcher? Nope. Not that either. She seemed distracted the whole time we were there so breakfast took forever AND I didn’t get the hydrate at all. And I also got a 13.1 magnet for my car finally! On the way back from the expo, we picked up some $1 frozen margaritas despite it being fuh-reezing outside! Seriously.. the high was 51 and super windy — that’s worse than NJ! Chilled in the room for a bit and then got dinner at Red, White, and Blue in our hotel. I was nervous about my stomach for the next day so I stuck with salmon and potatoes. And TONS of water. The food was pretty good and I kind of geeked out when I noticed HRG. Decided NOT to be creepy and say hi. But I thought it was awesome to spot a blogger <3. Somehow, it was really late by the time dinner was over so we headed back to the room to hang out (and watch Hangover!) before bed. Stay tuned for the big day :). I’ll try to post part 2 tomorrow. I have to do homework tonight so of course, I’m blogging instead. Friday’s run was a milestone for me. I typically run outside at an 8:30 pace, but a little slower inside (9+). I know people claim treadmills are EASIER, but I disagree. 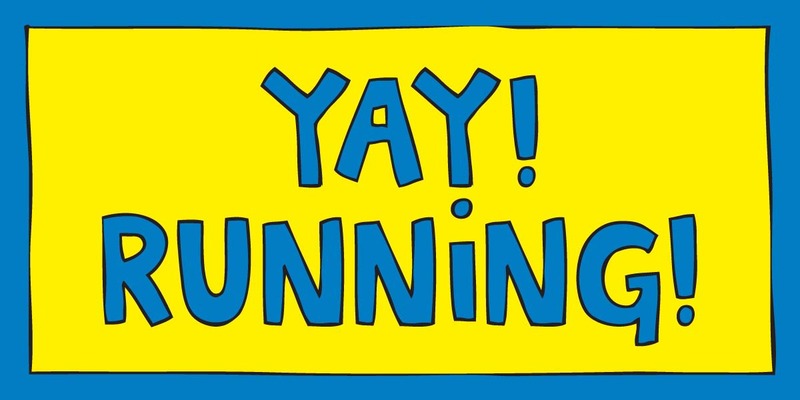 The feeling of running outside makes me run a lot faster! On Friday, the alarm went off and I was still mildly dying from cramps 😦 so I told R that I wanted to sleep in. He gladly reset the alarm for 45 glorious extra minutes of sleep :). By Friday night, I really just wanted to RUN! So I printed out a 5 day free pass to Workout World and went to pound out 3 miles on the treadmill. One of the parts I love about WOW is that they have a cardio theater. It’s a separate room where they play concerts on a huge screen. The room is a little dark and has a bunch of treadmills, bikes, and ellipticals. When I first started running, it was a great way to run without feeling like everyone was looking at me dying! Now, it’s a little different, but I still enjoy running to a concert. Friday was Bon Jovi :). Aaaaaaand… I did 3.15 miles in 25 minutes! That’s a 7:56 pace! My previous fastest pace was an 8 min mile on the treadmill and it was just 1 mile. Best UNOFFICIAL mile was 7:45 in my last 5k :). So happy to get an official pace PR! Saturday, my sister and I headed to NYC to go dress shopping for me :). That post will be for another day when I get pictures of the dresses from my aunt. But it was a great experience and I may have found my dress (or 4!). 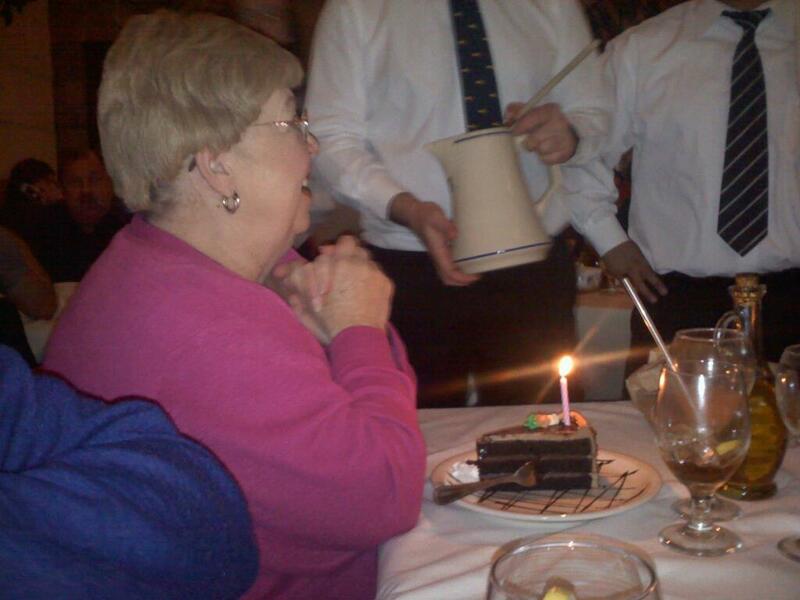 After a long day of shopping, we met up with R and took my Grandma out for her 79th birthday. We went to a Portuguese place and looooved it. We even had them sing her Happy Birthday! Isn’t she adorable? She shed a few happy tears :). Today, I woke up at 7 (yay for the extra hour of sleep! ), showered, and headed to church and RCIA. Afterwards, I came back to eat a lil something and change before heading out on my long run! Vegas is less than a month away and it feels great to be able to do my long runs without collapsing! I think I’m ready to blast through that 2 hr goal (during my last one, I ran in 2:00:47!). The 9 miles flew by in 1:17. Phew! The only downside to the run? My first experience with chafing and it was NOT a good time… I need to do laundry so I wore one of my older sports bras. BAD IDEA! It moved around so much that it left a horribly painful chafe mark right above my bra line. How so you relieve the pain?? I don’t want to feel it when I put on a real bra tomorrow. Ouch. Hoping to finish my homework tonight so I can get through the work week without worrying about it. Meh. Toodles!